20,000 for nearly a year. Alice had a son who lived in Kitgum town and on coming back home, he came with seeds to start growing chili. He pitched to me about the profitability in chili growing. I thought about it but instead sold the idea to my friends. Since knew some of the customers who used to eat from the restaurant while looking for chili to buy, I would link them to these buyers and get paid on commission basis. After one year working as a middle person , I realized I was not making much progress while my friends prospered. For instance, I would link them and they could make over Shs 1m (285.8 USD) and get paid like 20 USD about 70,000 sh. Starting I decided to start saving money. By 2014, I had saved a significant amount of money (260,000 shillings), which I used to rent a piece of land at 50,000sh per year where I started farming chili as a business . With the money saved, I hardly found any problem starting the chili business. After this, I then bought my personal piece of land where I currently grow chili. Since Gulu Agricultural Development Company (GADC) offered me a good business opportunity I decided to work with them. They trained me on organic farming principles” and latter offered me to work with them as a lead farmer! under the program Transforming Agriculture for Improved Livelihood (TRAIL) since 2015 , I do not operate on a very large scale, but I am one of their most regular suppliers. of an acre compared to chili which I can use about 100,000UGX for mainly harvesting Says Jenifer. With proceeds from the chili business, I managed to continue paying my two sisters, one of them has sat for Uganda Certificate of Education (UCE) and the younger one in senior two. My first born (girl) now goes to primary three. part of the work I do with GADC, my day ends at 5pm except for the days that I spend with my two daughters! I plan to make my sister do any vocational course of her choice so that we can join hands! 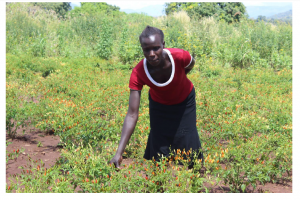 Initially, I had dreams of living in Kitgum Town; ‘I wanted to leave the village because I thought better life opportunity was there but now am better off here with chili farming ’ Jenifer concludes!